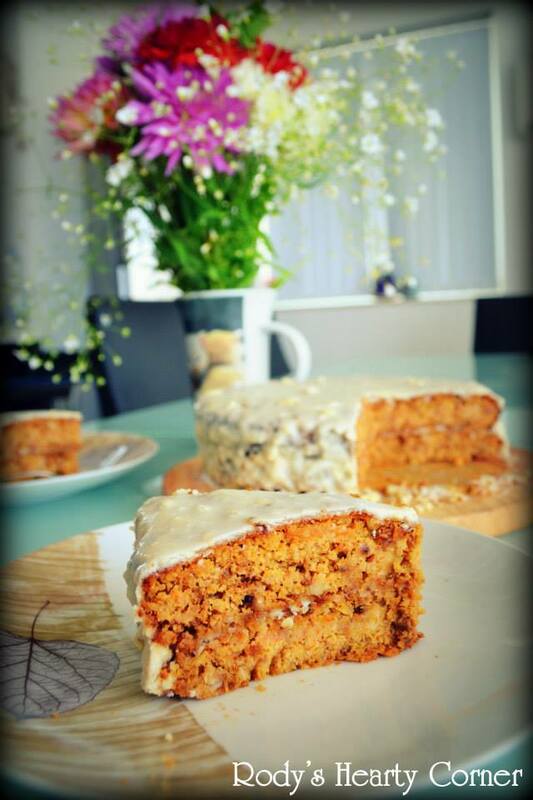 May I share some views with you; this is, I believe one of the most difficult cake recipes I have here on my blog, so if you are looking for a quick and easy recipe I suggest you try out the banana cake recipe. If you have some time to spare in the kitchen though or if you’re looking for that special occasion cake, I invite you to try it out because it is quite an amazing treat. My suggestion is to prepare the cake a day in advance so that it can come together and flavors can fully develop while it rests in the refrigerator. Preheat the oven at 180°C. (Oven temperatures vary. For a gas oven use 190°C and for a convection oven use 170°C). Blend carrots and pineapple in the food processor until pulp is formed and no big carrot chunks can be seen. Add the remaining liquid ingredients in the food processor and blend. Add the dry ingredients except walnuts and blend scraping the sides every now and then. Add the chopped walnuts and give a last mix with the food processor. Divide the batter between two round cake tins and bake in the oven for 1 hour 20 minutes. After an hour you can test if cake is done by inserting a toothpick in the middle. If it comes out clean then the cake is done. Otherwise give it some more minutes in the oven. Put the cakes on a cooling rack and allow to cool before storing in refrigerator. Best if you refrigerate overnight before covering with frosting. Prepare the frosting exactly before covering the cakes as it will change texture over time. Roast the cashew nuts for 9 minutes (make sure not to burn) and mix in a bowl containing the creamed coconut. Blend the two together with a hand blender until no chunky cashew nuts remain. Place one cake at the bottom of a plate and cover with a thin layer of frosting. Place the other cake on top and cover the surface with frosting spreading it also on the sides. If your coconut frosting turns runny you can pour the frosting on top and allow it to drizzle all over the sides. You don’t need to make a tick layer of frosting as it is extremely rich in taste. The creamed coconut frosting will harden when chilled in a refrigerator. It will melt again if left outside for a long time therefore keep it refrigerated until it's serving time. can you please tell me what size of cake pan did you use? are 2 8 inch cake pans good? Hi, I used 8 inch cake pans!